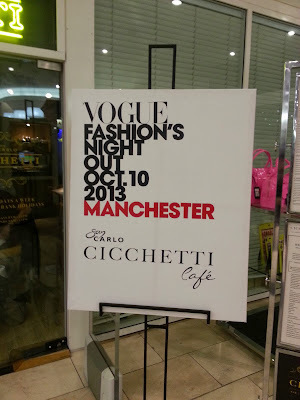 Welcome to the 126578th post about the Vogue Fashion Night Out held on the 10th of October in Manchester. I know, I know, you have already heard, seen, read everything about it but you have to understand that for us, fashionistas buried inside the deep north, it was THE EVENT OF THE YEAR. The truth is that I have never seen Manchester so beautiful. The best selection of the English fashion pack was here to celebrate the famous Vogue even held once a year, usually in London, this year, incredibly, in Manchester. The city centre was crowded like I have never seen before, with lights, decorations, parties and people, people, every kind of people, all over the streets. Even God was so excited about it that, for once, didn't plan any rain. As expected, the big department stores and of course, the Arndale (the big shopping centre in the heart of the city, if you don't know Manchester) were massively involved. After imposing my precious Husband to stay home with Precious Baby and Adorable Dog, my personal Vogue Fashion Night Out started with a meeting with fellow bloggers from Manchester Fashion Week and the Arndale Press team in the Yo Sushi restaurant, where surrounded by sushi we were informed by all the activities prepared for the night in the mall. Nearly every single shops had something going on, with catwalks and dancers in the exchange court from different stores, showing the latest collections every 20 minutes. The activities in the place were endless, I got a list of 4 PAGES with all the stuff going on, impressive isn't it? All over the shopping centre there were competitions (one of the prize was a year supply of shoes people! ), pods with free makeovers, photo shoots, discounts, goodie bags, drinks and music. Heaven? Yes, probably. I had a good look around and I decided that, if next year there will be another event like that, I am gonna camp inside the Arndale. There were a giant pair of red stilettos to take photos with in order to win a prize and the actress Sarah Jayne Dunn was there to celebrate the event. After this meeting, I went home to leave Precious Baby (yes, he was with me at the press call and for the special occasion he wanted to be fashion so he was wearing a tieeeee!) with the Perfect Husband and I went back to town. I really wanted to get my nails done in the Chanel pop up salon in Selfridges but when the manicurist is Sophy Robson you have to expect an endless queue so I passed. Same problems for meeting Matthew Williamson in Flannels or listening to Francesca Burns (British Vogue fashion editor), I just couldn't wait there, I really wanted to see and do as many things as possible. First stop was in Debenhams were I had the pleasure to meet Olivia, one of the personal shopper. She showed me and Sally the dedicated changing rooms and explained everything about the personal shopping experience. I wanna go more in depth about this great service so I will have a dedicated post soon. On the ground floor every counter was offering makeovers and pictures with the outfit chosen for the night. All the new collections were showed around and I can strongly recommend you to have a look to the special designer's collections in store, to get the most up to date fashion at a fraction of the price. Second destination was for me Marks&Spencer, where DJ Mike Toolan from Key103 Radio was providing the soundtrack for stylist presentations, with personal shoppers going around the shop and drinks offered to all the visitors. 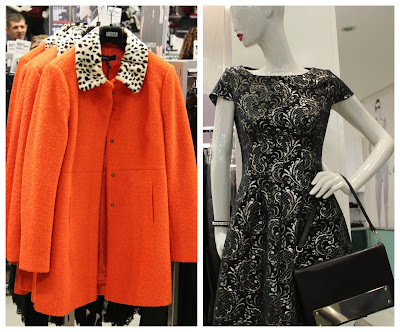 There are some ace pieces in the winter collection, as this orange wool coat and these prints I really like. After browsing around the shop (have you ever seen the new beauty section in M&S? No? Big mistake, is amazing!) I went to the Hervia Bazaar party, held in the shop. I probably went too late because to be honest, there wasn't a lot going on, apart of drinks, chinese snacks and music and a 10% off any purchase. It was anyway nice to have a look around the quite unique designer pieces stocked there, as Carven and Holly Futon. I was kindly given a sample of the Carven Eau de Toilette, one word: amazing! 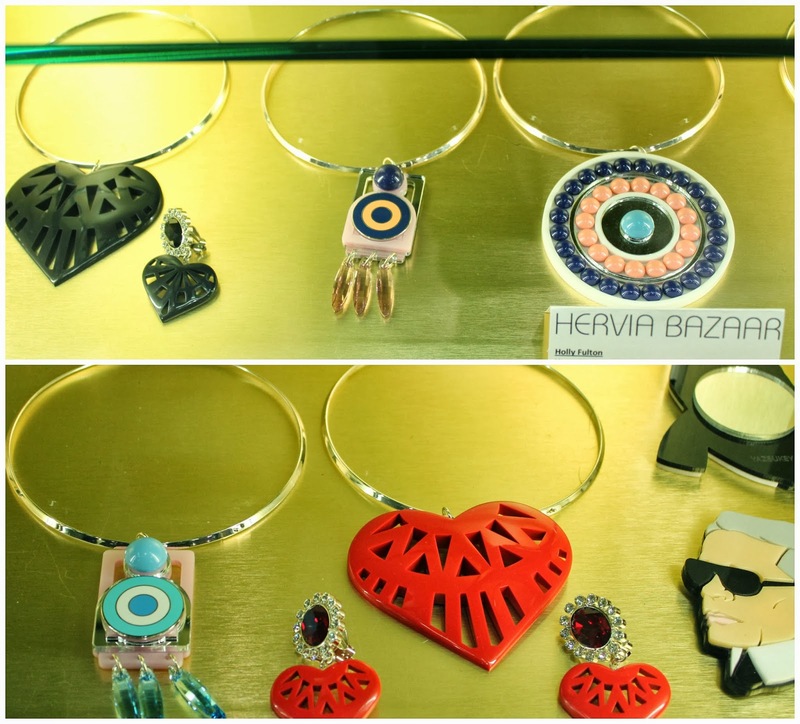 If you are shopping online on the Hervia Bazaar website, you can use this code VFNO10 to get a 10% discount and it will be valid until the 31st of October. After a quick visit to French Connection, that was enjoying clients with live DJ music and drinks, I threw myself in Selfridges. NEVER SEEN SO MANY PEOPLE. There was music, makeovers, drinks, popcorn, candyfloss, but I didn't stop: I was a woman on a mission, and that mission was under the name of Louis Vuitton. 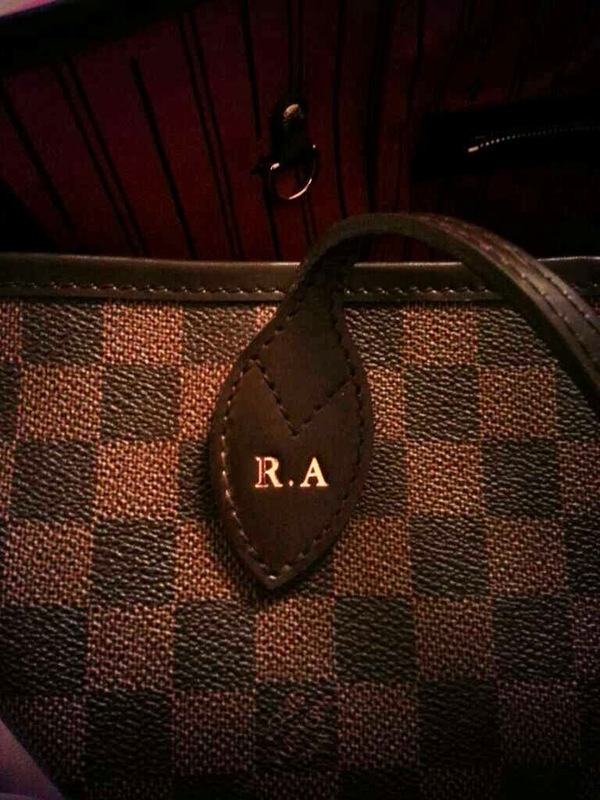 To celebrate the night, the boutique was offering the engraving service for free. I had my beloved Neverfull bag with me so I had my initials hot stamped in gold on the handle. SO POSH. After dreaming a bit whilst sipping my drink in this LV heaven, I went straight to House of Fraser where I met my lovely friends Sindy, Joanna, Ashleigh. Of course House of Fraser (which is one of my fave place to shop in Manchester) was offering so many fun things to do, like Dior makeovers, photo shoots, special drinks tasting from Bem Brazil, a brazilian restaurant and a unique menu for the night, crafted just for the occasion by the famous chef Aldo Zilli, in the ground floor restaurant, Cicchetti. 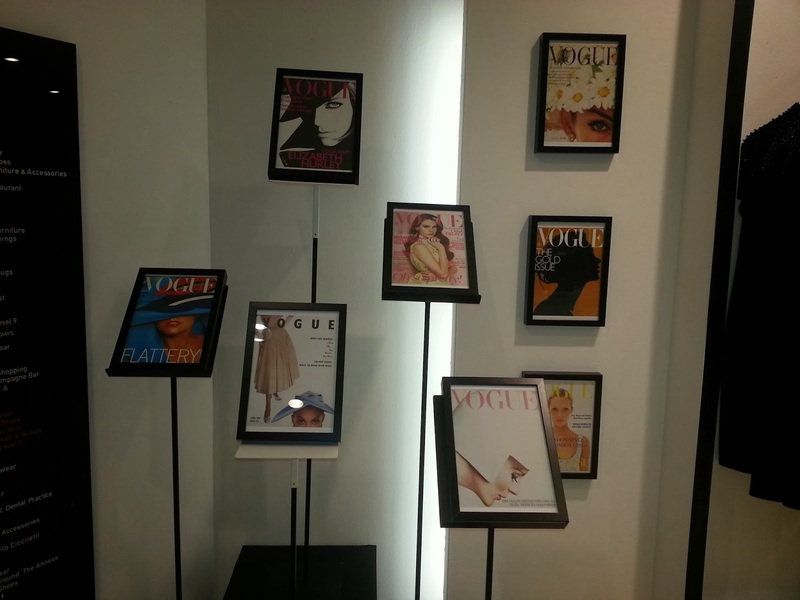 When going upstairs, it was nice to see this exposition of old Vogue's covers. There were competition to win gift cards...should I go on? Last stop for this poor, tired, but thanks God fitted with flat boots, blogger, was Emporio Armani in Spinningfield, were the party with live music station and drinks was in full swing. This was a very bad move. I have been looking everywhere for a fake fur jacket for this season. I found about 7 perfect REAL (insert scream here) fur jacket in this place in 10 minutes. Very very bad, too many temptations around this shop. There were few celebrities spotted around town, here are the only ones I spotted: The Radley dogs!! My night finalyy finished in the most glamorous way, eating a helaty burgher king happy meal at the tram station. Tres chic. Ok, I adored the way Manchester answered to this event. I loved the billions of people around, the full party mood all over the centre and all the initiatives around the shops. Some were better than others (some music in the corner and few drinks is not an event! ), of course, and for certain events the queue was just unbearable, but I really hope the Vogue Fashion Night out will come back next year. Thank you so much to the Manchester Fashion Week for the help and the support, to the amazing Press Team in the Arndale, Debenhams and House of Fraser.